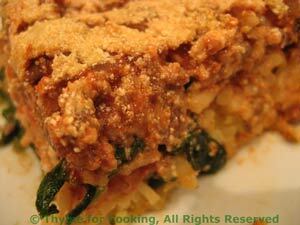 Thyme for Cooking Dinner tonight: Spaghetti Pie. Another retro dish, this was very popular in the late '70's. This has, as usual, been updated a bit - made healthier. I used less cheese and added spinach. This should use up the rest of the ricotta. Add any leftover tomatoes to the sauce. This has the flavors of lasagne, but quicker to put together. You could make it in a spring-form pan and unmold it for a fancier presentation. Heat oil in skillet over medium heat. Add onion and sauté until tender. Add garlic and beef and sauté until meat is done, breaking it up as it browns. Stir in herbs, vinegar and tomato sauce. Cover and simmer until needed. In large bowl lightly whisk the egg. Add 2 tbs of the ricotta and whisk. Toss to cool a bit (do not rinse) then add to the egg mixture. Mix well and put into an oiled, glass baking dish (mine is 9 inches square). Pat into place. Fluff the spinach a bit with your fingers and sprinkle it over the pasta. Drop the ricotta by small spoonfuls evenly over the top and spread out a bit. Spread the meat sauce evenly over the ricotta.